On March 13 to 15, the Chandler Chamber of Commerce in Arizona will sponsor the 27th annual Chandler Ostrich Festival. 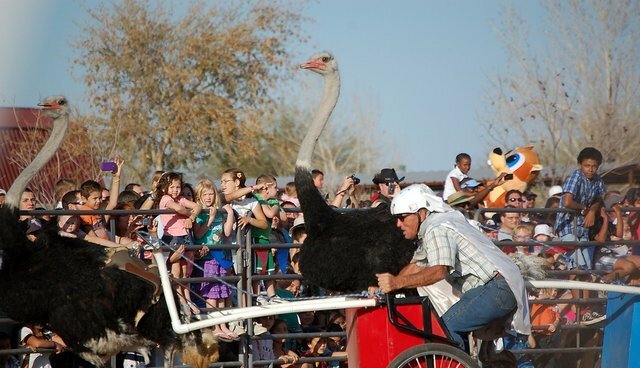 Billed as a "community family event," the festival features ostriches forced to pull chariots and carry men on their backs in a degrading and potentially injurious spectacle of animal abuse with no family value at all. Once boasting a turnout of 300,000 people, this year's festival is predicted to draw 100,000 visitors, according to an article in AZ Central, "Ostrich Festival is as big as the birds, 3/13-15," which also last year reported that "About half as many visitors came to the 2013 festival as during typical previous years." The Chandler Ostrich Festival is a relic of outdated attitudes toward birds and other animals without relevance to the good of society or the wellbeing of the planet. "Ostriches belong to the oldest living family of birds on earth," said Karen Davis, President of United Poultry Concerns, an organization that promotes the compassionate and respectful treatment of domestic fowl. Ostriches are nomads, designed by 90 million years of evolution to roam over vast tracts of land. Their long necks and excellent vision enable them to survey the land for miles in all directions at once. If they appear awkward in captivity, it is because these fleet birds, with their strong family ties, are meant for wide open spaces, where their grace and intelligence can be exercised. "Forcing ostriches with their long thin necks and legs and their large fragile eyes, that can easily be injured, to race around a track with a bully on their back, pull chariots and do other dangerous, unnatural and degrading things, is a type of entertainment that is losing public support," said Davis. Ringling Bros.' recent announcement that it is eliminating elephants in circuses represents the trend away from entertainments like the Ostrich Festival that make animals suffer for fun. "A better informed public is looking for clean fun, not mean fun," Davis said, noting that "there is nothing wholesome about demeaning any creature and teaching children this terrible lesson. Compassion and respect for animals and for one another is the only good lesson. Clean fun, Yes. Mean fun, No. The Chandler Ostrich Festival is both cruel and obsolete."